As I entered the drawing room of the Ring Road residence of Sardar Hukam Singh in New Delhi, I saw him at the far end of the room-cold, stiff, erect and forbidding with his hands folded in greeting. As my eyes adjusted to the soft light of the room, I saw that I had been fooled by a life- sized cardboard cut out presented to the former Speaker of the Lok Sabha when he was Governor of Rajasthan. The real Hukam Singh was smiling warmly and beckoning me closer to him. I was not the only person to have been fooled in this manner. Many had been confounded by the two images, one an illusion and the other real. In fact, there were so many ironies about the man whose 10th death anniversary fell on May 27, 1993. As Speaker and Governor, he swore to uphold the Constitution, the very Constitution which he had refused to endorse as a representative of the Sikh community in the Constituent Assembly. A man who did not hold any political office before Independence, Hukam Singh rose to the highest echelons of political life in free India. He could be as firm as he could be polite - one could go on and on, but we must know more about the man who shaped the parliamentary traditions of our nation. He was born in Montgomery, now in Pakistan, on August 30, 1895. His parents were poor and after studying as the local gurdwara, he enrolled in high school. Hukam Singh’s father, Sham Singh, died before the former completed his matriculation. Hukam Singh graduated from Khalsa College, Amritsar in 1917. A job as inspector on the Department of Cooperative societies followed, but he resigned two years later. Hukam Singh passed his LLB examination in 1921 and started practising on Montgomery. He was nominated member of the newly formed Shiromani Gurdwara Prabhandak Committee (SGPC). The organisation was declared unlawful on January 7, 1924. The members offered themselves for arrest and Hukam Singh spent the next two years in Mianwali jail, where he came in contact with Baba Gurdit Singh (of the Kamagatamaru fame), Khan Abdul Gaffar Khan and Sardul Singh Caveesher. He saw released on September 1929, and he resumed his legal practice in Montgomery till August 1947. Partition meant losing his home and nearly his life. Fanatic communal leaders had put a price of Rs 25,000 on his head, but Hukam Singh escaped from Pakistan-uprooted and penniless. Not for long. The Maharaja of Kapurthala appointed him a Judge on the recommendation of Giani Kartar Singh and Master Tara Singh (see Court Attire). He was soon nominated, through the intervention of Giani Kartar Singh, as a member of the Constituent Assembly, where he was sworn in on April 30, 1948. The Constitution was adopted and India was declared a Republic on January 26, 1950, and the Constituent Assembly became Provisional Parliament. Hukam Singh, as an Akali representative, did not sign the Constitution, contending that it did not have any legal safeguards for the minorities. In 1951, Hukam Singh launched a weekly English-language journal, The Spokesman which he edited till he was unanimously elected Deputy Speaker of the Lok Sabha in 1956. Many were surprised at this. Not only was he an Opposition member, he was also one of the two MPs of the Akali Dal. 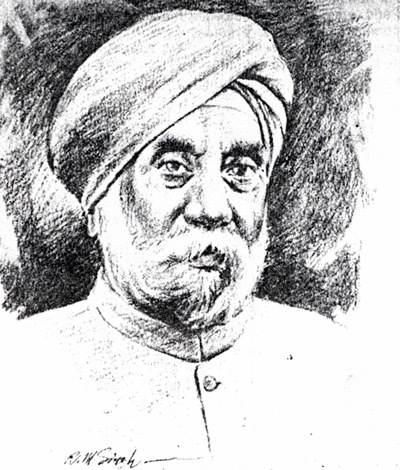 (He had been the President of All-India Akali Dal in 1951). In fact, he continued to be an Akali till the General Committee of the Dal decided to join the Congress party in 1956. Some people accuse him of having struck a secret deal for giving up the demand for Punjabi Suba and getting the post of Deputy Speaker as a reward. The charge did, however, hurt deeply. Pratap Singh narrates a poignant incident of how Hukam Singh, soon before he died, said that God was his only witness but that he was clear in his conscience that he had never betrayed the Sikh cause. “After saying so, Sardar Sahib was a bit emotional. Tears rolled down his cheeks. I tried to console him but he wept like a child,” recalls Pratap Singh. Hukam Singh continued as Deputy Speaker till 1962, when he was elected to Parliament from Patiala constituency on a Congress ticket. He was then unanimously elected Speaker of the Lok Sabha. Sardar Hukam Singh, the first Sikh speaker of the Lok Sabha served during the tenure of three Prime Minister - Jawaharlal Nehru, Lal Bahadur Shastri and Indira Gandhi. He was often described as a fair and firm Speaker who set a number of healthy precedents in conducting Parliament. He did not stand for re-elected because he wanted to set the precedent that the Speaker must be elected unopposed and he could not be assured of this. He was appointed Governor of Rajasthan in 1967 and he retired in 1973. He took over as the President of the Singh Sabha Centenary Committee in 1973, with Giani Gurdit Singh as the General Secretary. The body was renamed Kendri Singh Sabha in 1976 at Anandpur Sahib. It was the apex body of Singh Sabhas in India and abroad. Hukam Singh fell ill in May 23, 1983. He was admitted to nursing home in New Delhi where he died on May 26, 1983. At his deathbed where his daughter, Raminder Kaur, his son-in-law, Brig Hari Singh (retd), and other family friends, including Partap Singh. The first Sikh President of India was also at the deathbed of the first Sikh speaker. Giani Zail Singh, on being informed by this writer about the precarious condition of the former Speaker, had rushed from Rashtrapati Bhavan to the nursing home. I saw the then President’s eyes filled with tears, even as he stood there with folded hands. When he (Hukam Singh) reached the palace, Maharaja Jagatjit Singh was sitting in the veranda. His Prime Minister was by his side. Hukam Singh wore a khaki shirt and trousers, but he had no coat or tie. On seeing him from a distance, the Maharaja enquired of his Prime Minister, Mr L.R. Sikand, as to who he was. Sikand guessed that he was probably the candidate recommended by Master Tara Singh who had come for an interview for a seat on the bench. The Maharaja was known for his refined taste and cultured manners. He outright rejected Hukam Singh. The Maharaja’s view was that with a trouser and shirt, one must have a tie. But destiny was playing its own part. The Prime Minister intervened and said: “He is a refugee coming here without any belongings. When he draws salary from the treasury of Your Highness, then he will buy ties and other things.” The Maharaja agreed to appoint Hukam Singh as a Judge of the High Court. © 2019 Roopinder Singh journalist, author & photographer.